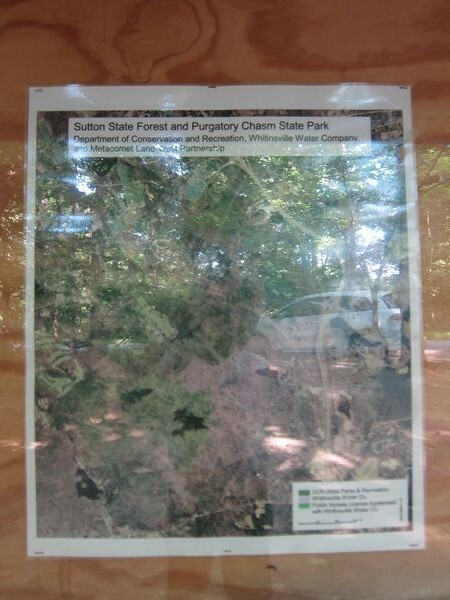 On July 14, 2012, we did a walk through the Sutton State Forest. 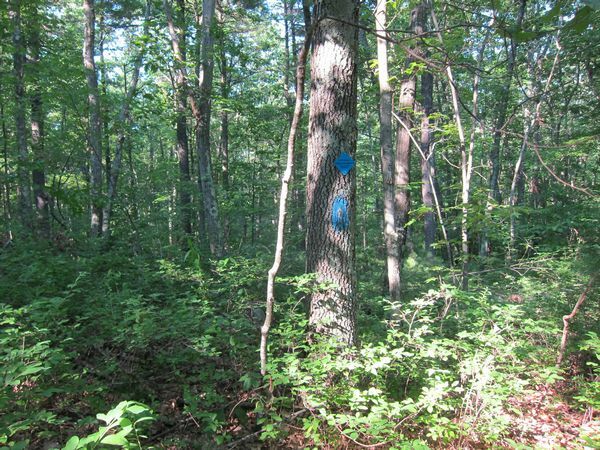 This area of the forest intermingles with land owned by the Whitinsville Water Company, so sometimes it's hard to know when you're on or off the State Forest land. 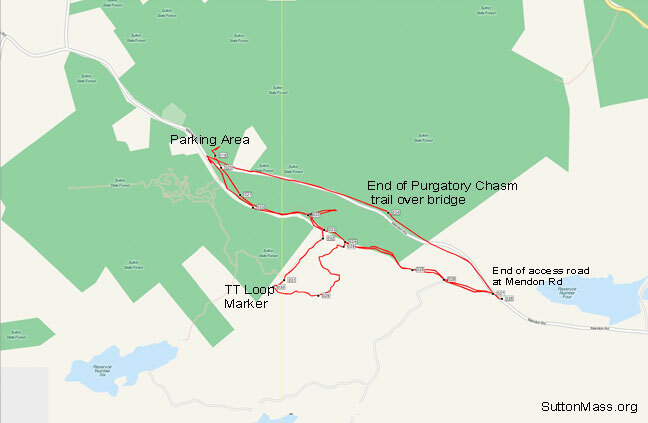 Here is the overall trail map of where we went, as well as notes and photos. 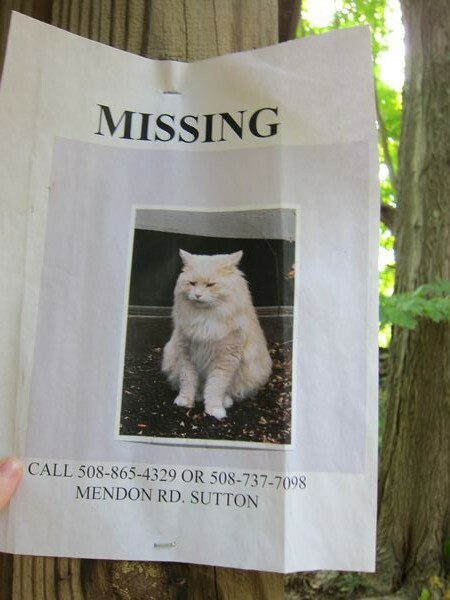 Note that we didn't walk the straight-line stretch of Mendon Road across the top. 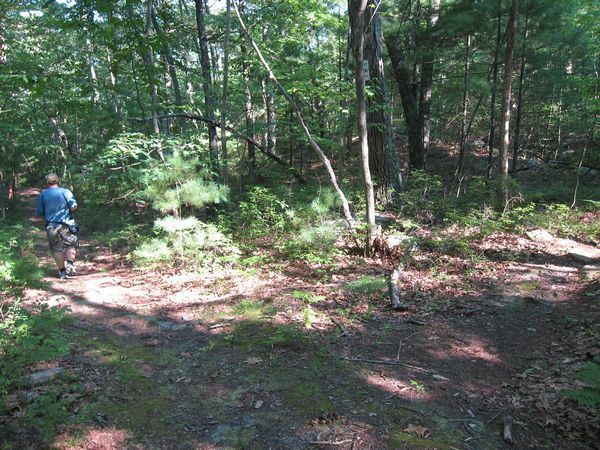 We drove that, in order to determine where the three trail heads in this area were located. If you click on the below map you'll get a larger version of it. The GPS points marked by us are mentioned in the text below. Here are our notes about this walk. To summarize it, it was 3.25 miles. We started at the top left parking area. 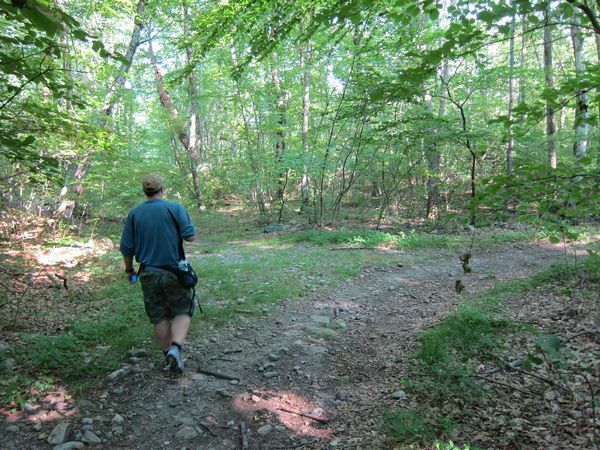 We walked straight along the center line, first between the two green halves, then along the southern edge of the green, then in the white area, until we hit Mendon Road. 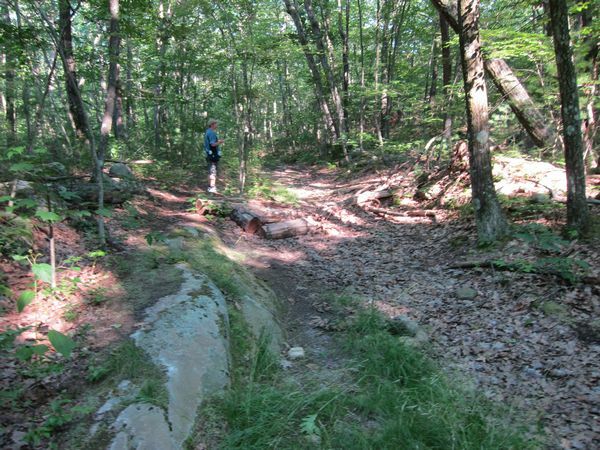 Then we backtracked until we ran into that first southern trail. 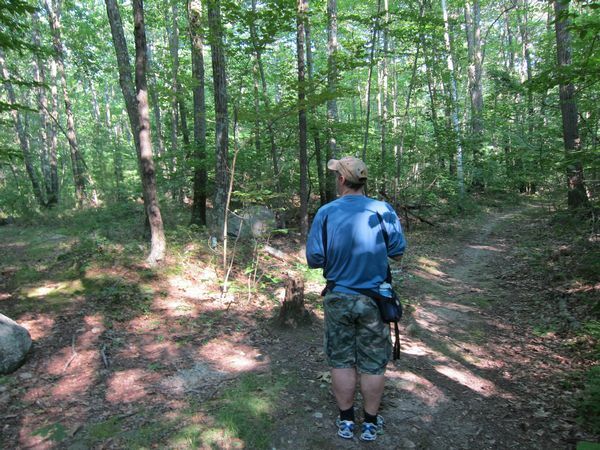 We did the southern loop, passing the TT Loop Marker, and returned back up to the trail. 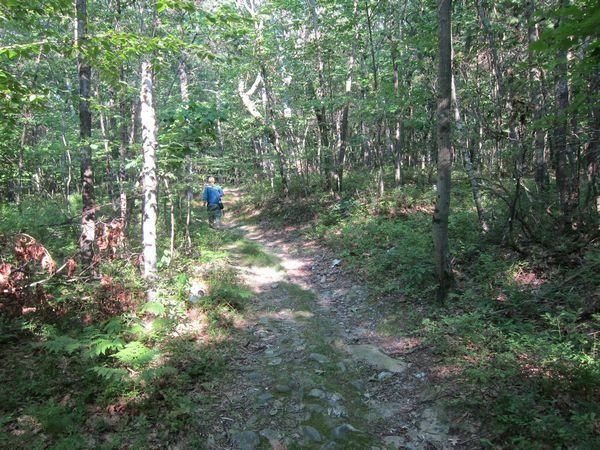 Then we returned northwest on the main trail to the parking area. 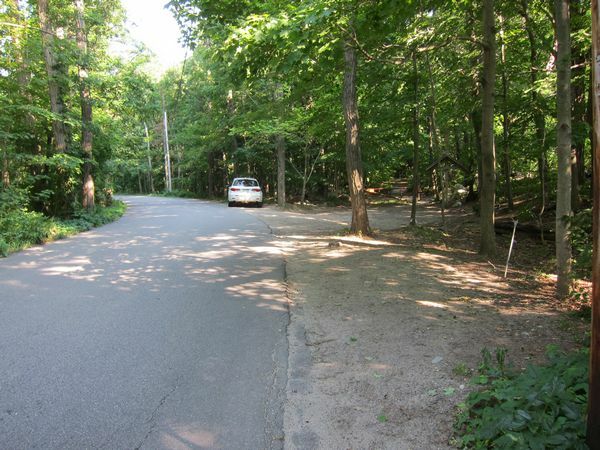 First, very little parking is available on the right side of Mendon Road. 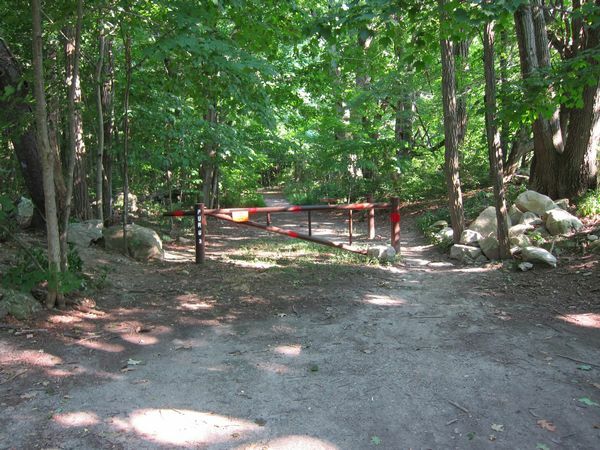 A brown metal gate with red markings on it blocks the main trail. This is marked "PURG 3". We marked this as spot 19 on our GPS. Our step counter began here at 917 steps. Their little hut area has two maps posted. On the left, a printout from Google Maps with the general land area. On the right, a breakdown of what land is state and what is owned by the Whitinsville Water Company. 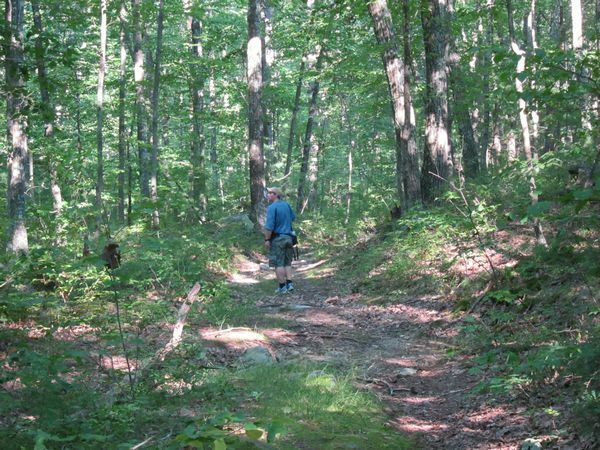 I have a better version of this on my Sutton State Forest Trail Map area. 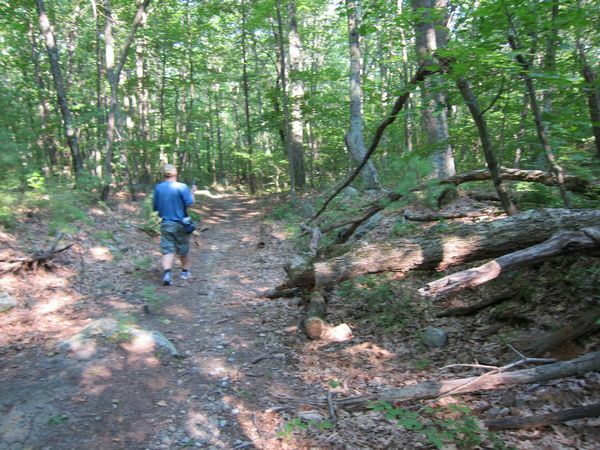 The trail is not well maintained. There are trees down, trees hanging over, exposed rocks, and exposed roots. 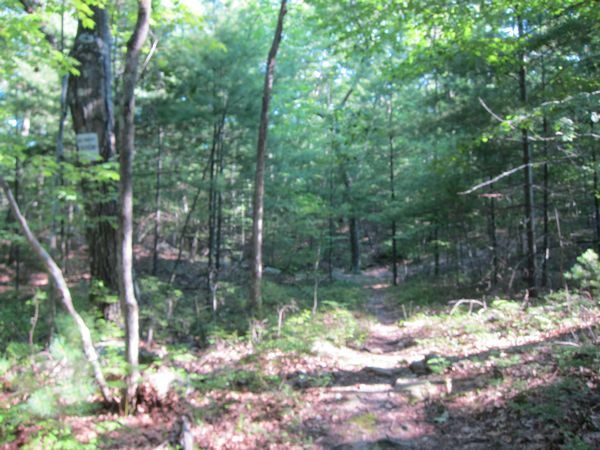 There are no trail markings along the main trail. Our first fork, not very far in on the trail. This is a substantial fork, with a full path going off to the right. We stayed on the main path, i.e. the left fork. 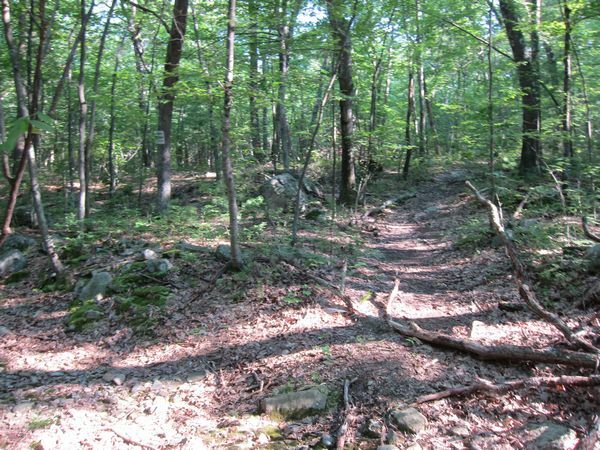 The main path is reasonably wide at the beginning. Note that it gets distinctly worse fairly quickly. Piles of trees along the path. We hit a second fork around here, marked spot #21 on our GPS. This was 1292 steps (375 net). We stayed on the main path, left. 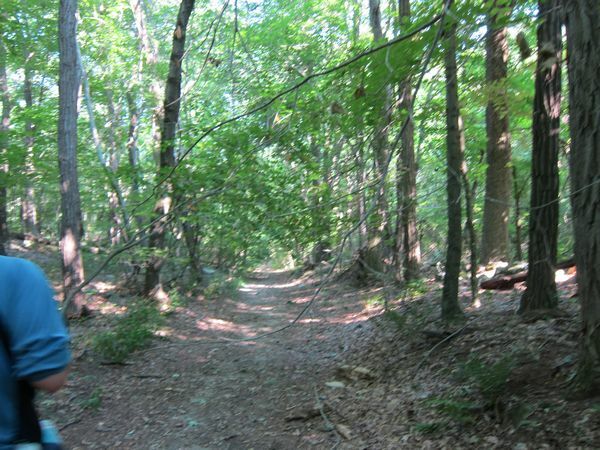 This is fork #3, with a small mossy path to the left. We discovered later that this side-path simply dead ends near Mendon Road. We marked this #22. This is at 1800 steps (883 net). We stayed on the main trail, to the right. A short while later, we saw a blue dot to the left. 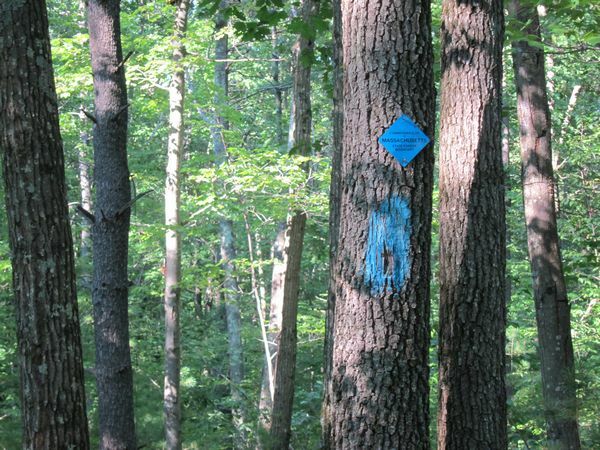 While this might seem to be a trail marking, it seems to be more a marking of the edge of the state forest. 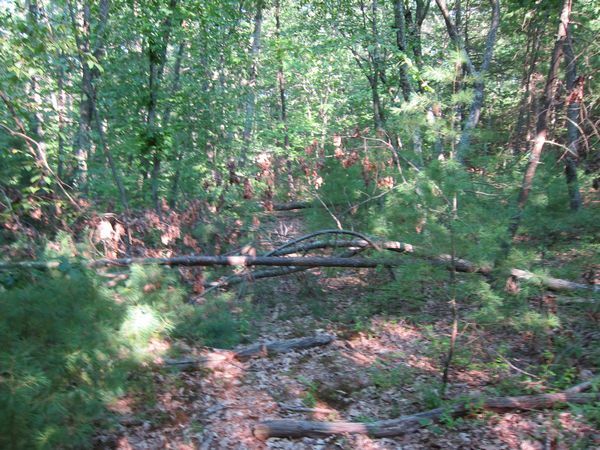 Then we hit a pile of logs, and a fork to the right with a no tresspassing sign and blue and red marks. We kept going forward. The side path with the no tresspassing sign. 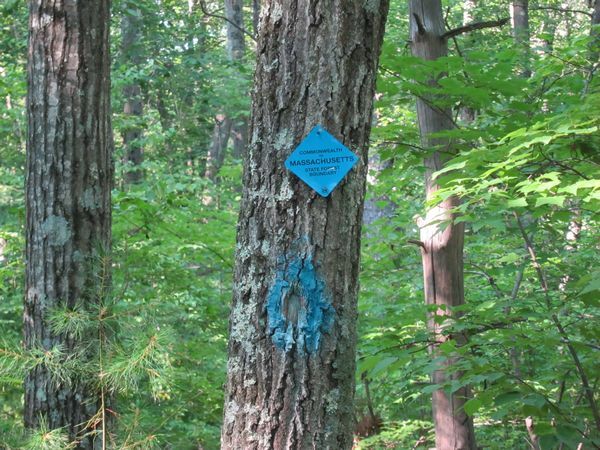 To the left were blue diamond signs saying "Commonwealth of Massachusetts State Forest Boundary". Another similar sign further on. Here we hit another fork to the right. Again a No Tresspassing sign by it. Looking up the right hand fork. 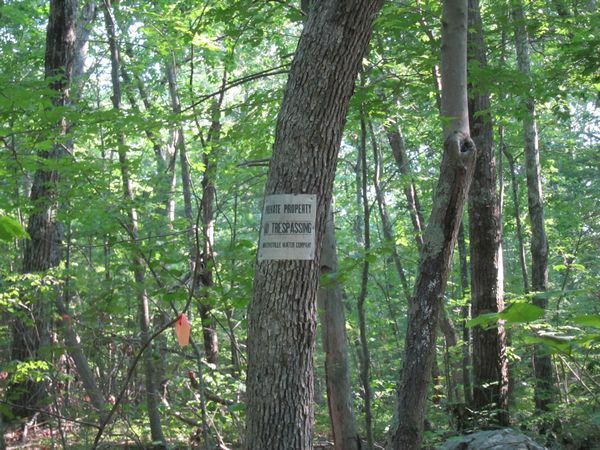 and on the left, the edge-of-forest signs. This is step 2189 (1272 net). 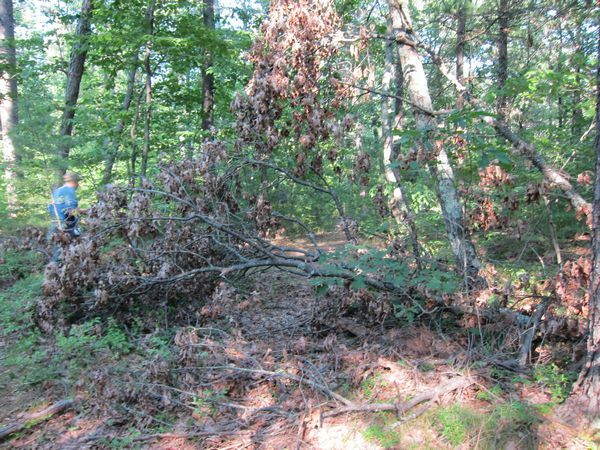 Now we began to hit serious blockages in the main trail. Entire trees had fallen down across it. 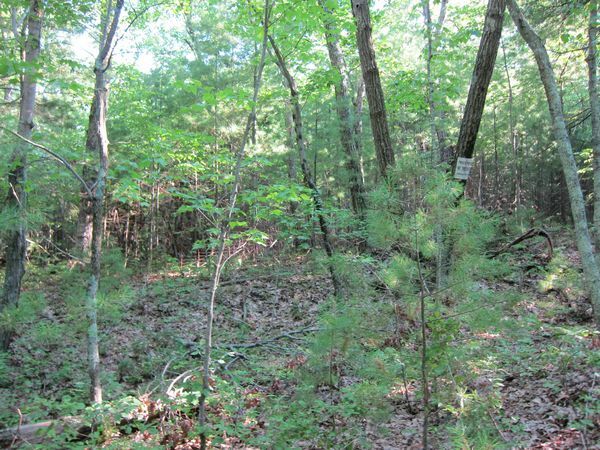 To the right, there's now an old wire fence on the right - you can see it between the trees. Also, the No Tresspassing sign.. About 2500 steps (1583 net). 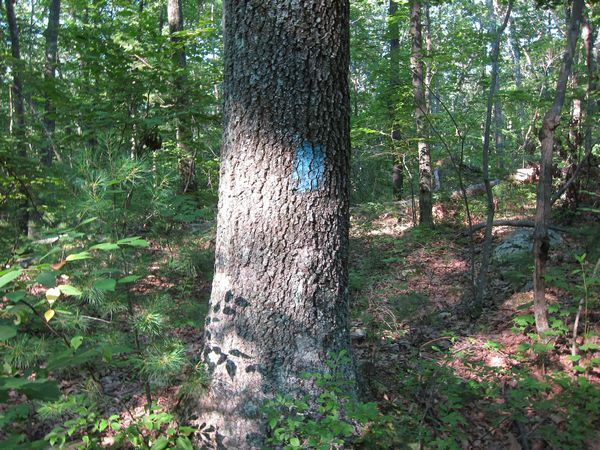 To the left, we hit a pair of trees on the left with triple blue marks on them. Behind the dotted trees you can also see a white house on the left side of the main trail. 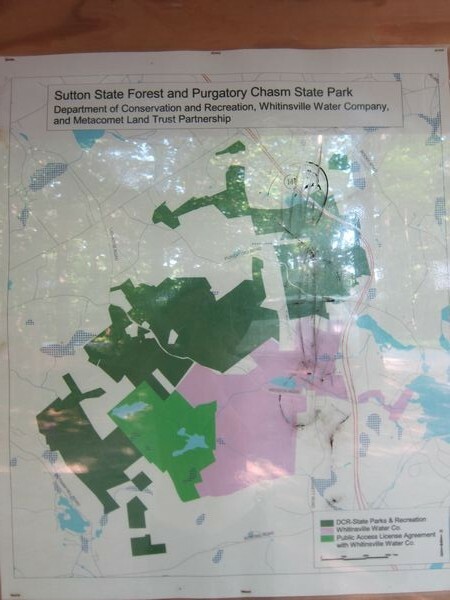 At this point it appears we crossed from the Sutton State Forest into Whitinsville land, looking at the map.